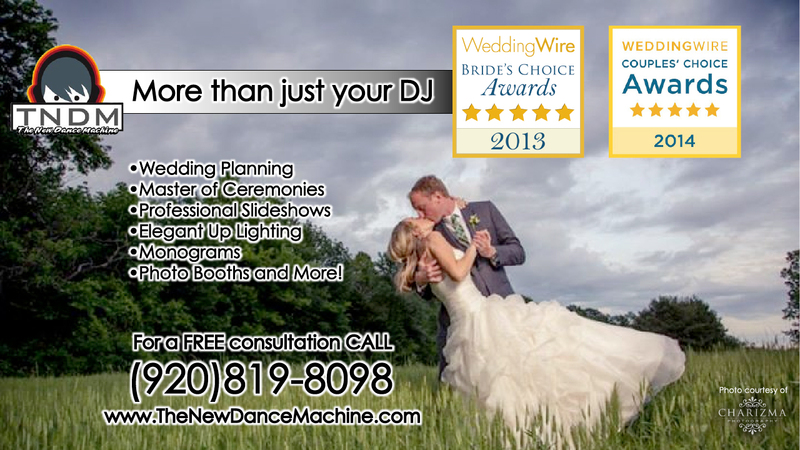 The New Dance Machine is owned and operated by Shaun Gehrke, an area DJ with over 10 years experience. He is known for his flawless mixing, and MC ability. With his club experience spinning records, as well as an appearance at The Detroit Electronic Music Festival, he has moved on to bring his mixing skills to a wider audience. Along with mixing beats, now transitioning all genres of music together to satisfy the masses, makes him the perfect wedding DJ. Being able to feel out the crowd and get them not only on the dance floor, but to keep them there, sets him apart from others. Our vast library of over 70,000 songs, can assure you that music in every genre will be covered with crisp, clear sound. From digitally remastered oldies, to today's top hits, we have them all. Using only music purchased through reputable sites like iTunes and Rhapsody, we are able to have this library with every song on the Billboard top 100 from 1958 to today. If by chance there is a track we do not have in our library, on the spot download capabilities takes care of that (as long as the venue has wi-fi, and the song is available through iTunes, or Rhapsody). Having this ability takes our shows to an all new level, being able to play for even the most diverse crowds. Keeping these tracks on multiple computers, external drives, and cd backups, makes our systems the most reliable in the industry. Our mission is to make a memorable experience at every event we DJ. Providing a fun and comfortable atmosphere for all guests. From weddings to school functions, we pride ourselves on understanding the needs of each event, tailoring every performance to the venue and client.